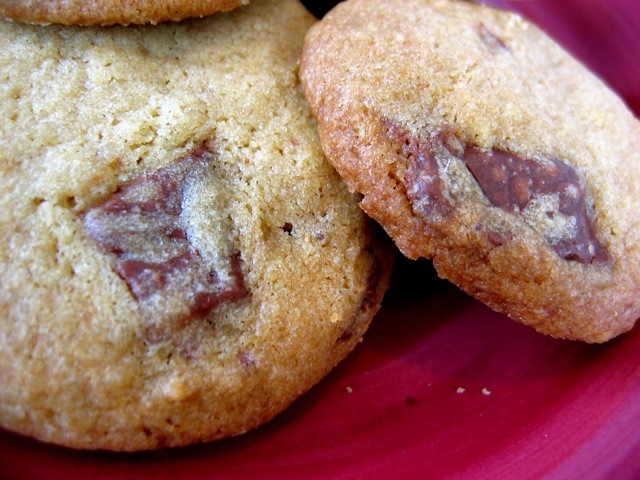 Read more about Heath Bar cookies in "Movie food." In a large bowl, cream the butter with the sugars until smooth, about 2 minutes. Add the egg and vanilla to the butter-sugar mixture and beat well. Add the dry ingredients and mix well, using your hands to incorporate all the flour. Mix in the Heath Bar pieces. Drop by rounded teaspoonfuls onto baking sheets lined with parchment paper. Bake for 10 to 12 minutes, or until the cookies are lightly golden. Cool for five minutes on the cookie sheets before removing to a wire rack to finish cooling. Culinate editor's note: Be sure the Heath Bar pieces are chopped fairly small; large chunks can be painfully crunchy. Cookie lovers who prefer a higher chocolate-to-dough ratio may want to add a fourth candy bar, or 1/2 cup chocolate chips, to the mix.